I came across these posters in a couple of blogs that I read and I can't stop thinking about them! There's something about the slogan "Keep Calm and Carry On" that I find so enticing. I want to just keep repeating it over and over. Maybe it should be my new mantra. Or maybe I'm having a mental breakdown. Upon the outbreak of World War Two the British Government's Ministry of Information commissioned posters to be distributed throughout the country as a means of allaying public fear. 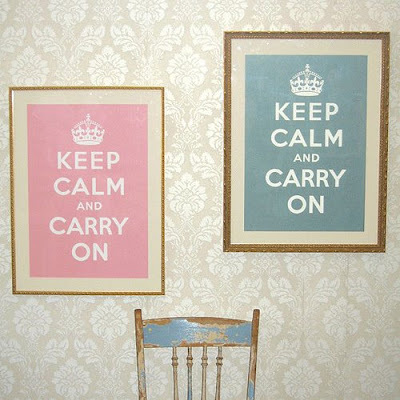 Three different posters were produced and while the first two designs were widely distributed the third poster, simply bearing the words 'Keep Calm and Carry On' along with the royal crown, was held in reserve intended for use only in times of extreme crisis. Although hundreds of thousands of these posters were produced, only a handful ever saw the light of day. 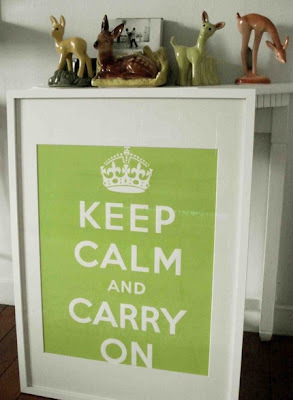 Even now 'Keep Calm and Carry On' is a phrase which perfectly encapsulates the traditional British 'stiff upper lip'.